Military Tanks Guarding Alien Crash Site? 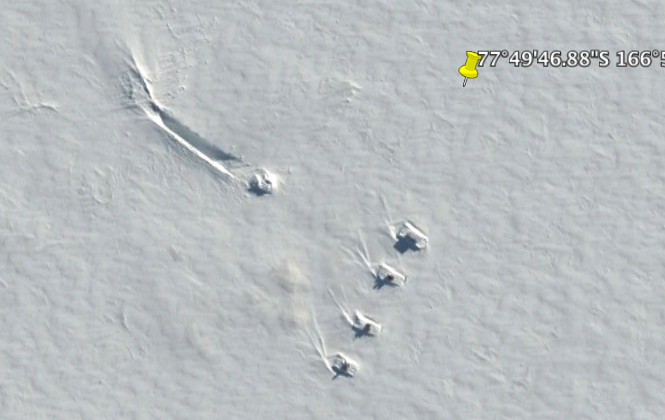 Lot of theories have come forward about existence of UFOs in the Antarctic. One such theory has recently come forward where someone has claimed to see military tanks guarding a UFO crash site. Valentin Degterev from the city of Nizhny Tagil in central Russia, says he found the UGO (unidentified ground object) online using Google Earth. The images can still be seen using Google Earth so we had a look at the latest and previous pictures of the area. The image above is the oldest Google Earth image of the controversial location with some objects. The image is dated 15th Dec 2009. On the right of the image, you can see as if something has crashed in to the ice. There is lot of activity seen on the left hand side and its difficult to know what this can be. If you goto Google Earth or Google maps and search for coordinates 77°49’46.88″S 166°50’42.43″E, you will see very less activity in the area. The most controversial image is the one above that was taken on 24th February 2011. The image shows the alleged UFO crash site with 4 objects in front of it. Conspiracy theorists are claiming these to be tanks which can be seen guarding the UFO object right in front. All objects are covered with ice. Some people have said that the tanks look too big to match any existing tank ever made but they do look like some sort of military tanks. If you goto Google Earth and see image, there is no activity surrounding this area. Then come this more clearer image of the location taken on 5th January 2012. From this image, it can be seen as if something crashed in to the ice and then made its way to the top. The crash shows nothing much but there are lot of vehicles and their tracks seen around the area. The latest image can be found on Google earth which is taken on 30th Oct 2014. 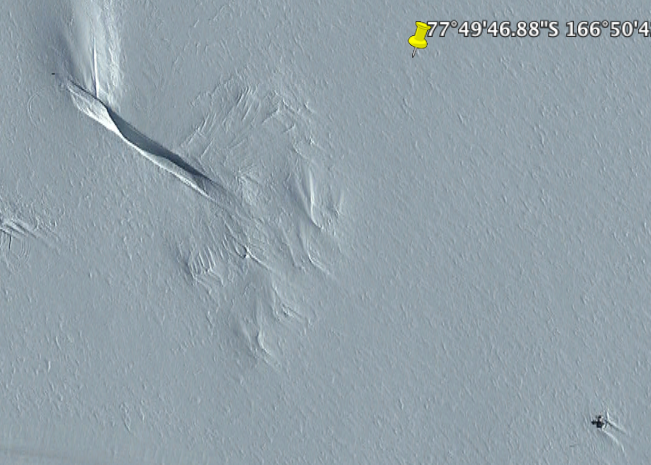 This image shows the same alleged UFO crash site and something right in front of it which is covered with ice. There is lot of activity seen in the area with containers, vehicles and some equipment like structures. Alien conspiracy theorists believe that this can be a site where an UFO might have crashed. It is believed that NASA is guarding the spot and/or are communicating with Aliens there. Some believe that its a secret military area like Area 51. 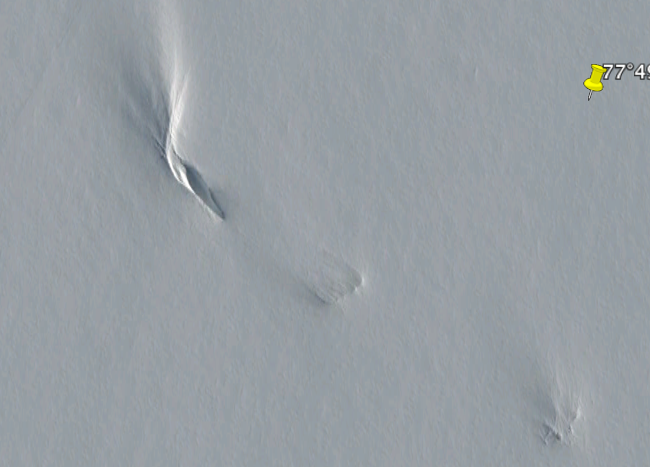 Yes, the image looks like something has crashed there but it also looks like some underground facility. This area is known ascott base and is spot of the New Zealand Antarctic research station. It can be possible that the activity seen there over years can be due to the research being done there. On the right of the area is an airfield known as Williams Field. Williams Field consists of two snow runways located on approximately 8 meters (25 ft) of compacted snow, lying on top of 80 meters (262 ft) of ice, floating over 550 meters (1,800 ft) of water. 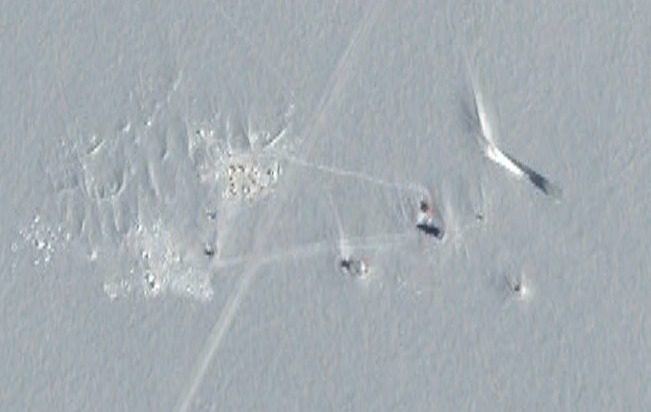 The airport, which is approximately seven miles from Ross Island, serves McMurdo Station and New Zealand’s Scott Base. Until the 2009-10 summer season, Williams was the major airfield for on-continent aircraft operations in Antarctica. The probability of the Alien story seems very unlikely but there has been no official word about this entire thing. Is there some secret in this story? All still remains a mystery.